The growing trend of real estate ‘flipping’ is becoming a staple of the Australian real estate market and the economy as a whole. ‘Flipping’ is a colloquialism coined to cover the process of purchasing a property, renovating and adding elements, and then reselling with the intention of making a profit. The idea of turning a profit isn’t the only motivation for a renovation flip, not even for those with investment properties. Many Australian property owners take on renovation flips as a personal challenge, a recreational project, or even with the intent to maintain the property as their residence upon completion. But making a profit is the essential mark of success. There are many different types of renovations that suit different motivations, but the initial purchase of a flip house’ relies on the same basic factors: cost, timing and features. The ﬁrst rule of investment renovations is to never underestimate the cost. Even experienced developers and renovators struggle with the initial projection, which includes not only the real estate and material costs but also negotiations, taxes, contractors and regulations. It is vital to allow plenty of room for contingencies, and unexpected expenditure of up to 40%. Before purchasing any property, you need to be sure you can afford a considerably higher price than the project is valued at, as a pre-emptive safety margin. The vast majority of investment property buyers in the Australian market have to take out loans to cover the cost of renovations, and often a mortgage on the property itself. A good guideline to follow is to not borrow any more than 50% of the total projected value, but to maintain a credit limit of approximately 80% to cover the buffer margin. The ideal real estate climate in which to purchase an investment property is at a time of deflation, so as to capitalise on the opportunity to purchase at a lower rate. However, with the current Australian housing market in a bubble of inflation, and economists predicting a lingering market, properties are less available at below-value prices, but the potential of adding value to an investment is considerably less risky. The least appropriate time to be looking for an investment property is when the market has a forecast of inflation. When purchasing a property for investment, you should be looking at properties that are being sold at lower than the average market value for their location and quality. Research into sales data in the area is necessary to purchase a property with good potential for capital growth. An ideal projection would be to buy at 20% below market value, though a purchase of this kind would be a rare find and comes about when the seller is highly motivated. Basic renovations will only work at the lowest end of the real estate market. The purpose of a basic renovation is to purchase a property at low cost due to its lack of functionality, repair or add to the property to bring it up to a regular living standard, and resell at the higher value of other properties in the area. These types of renovations are high-risk, because quite often the repair costs are high and the job is time-consuming, which means it’s more difficult to make a substantial profit and the housing market has time to fluctuate before the resell. Budget projection is vital, and it’s most important to get a property appraisal so that you’re fully aware of all the work you’ll be taking on. With this type of renovation, it is essential to have a contractor that you trust to complete the project in a timely fashion, and work with you to suit your specific requirements. Having a contractor on hand before you even purchase the property, to run through the potential of the project and get a rough idea of costs for your budget projection, is particularly beneficial for basic renovations. When initially purchasing a property for basic renovation, you’ll need to look for what the property doesn’t have rather than what it does, and the flaws in its basic functionality. A leaking roof, cracks in the walls, poor plumbing and ventilation systems, and broken gutters are the elements that will considerably lower the value of a property, and the elements that you’ll be looking to restore in a basic renovation. It’s the no-frills, common-sense inclusions that buyers expect when they’re looking to purchase a house, and restoring those basic features will raise the property to the general standard of living offered by the rest of the properties in the area, and raise the resell value. 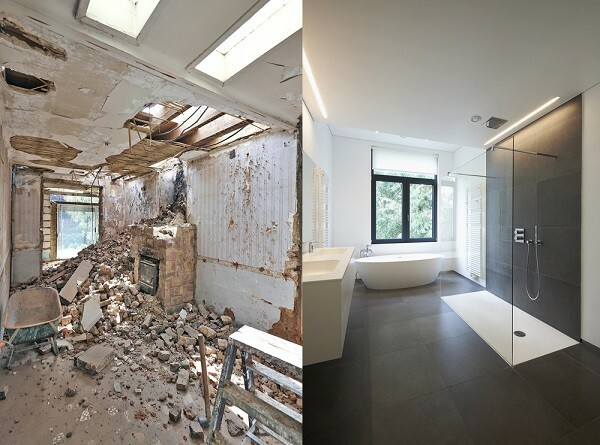 Cosmetic renovation is a quick type of flipping that works best at the lower end of the market. A cosmetic renovation is the best starting point for those who haven’t renovated before. As its name suggests, it’s all about making the property more visually appealing to potential buyers. When purchasing properties at the lower end of the market, it opens you up to a wider range of potential buyers who will be able to afford your eventual selling price. Properties in the less expensive suburbs will also carry a less particular clientele, who are less likely to have specifications for a particular stone benchtop or other minor details. Quite contrary to a basic renovation, the most important factor in a cosmetic renovation is that all vital systems such as plumbing and electricity must be completely functional. To fix those kinds of internal problems can be exorbitant, and the whole purpose of a cosmetic renovation is not to change anything on a structural or functional level. Time is also an important factor; you want to ﬁx and sell the property as quickly as you can so that you’ll be selling it within a similar economic environment and real estate market. Time is money, and ideally you’d want to flip the property in under six weeks before reselling. As with your budget, it’s important to keep a time buffer for any internal issues that may arise throughout the process and prolong the renovation. Surface improvements such as new paint, flooring, light fixtures, blinds and sinks can change the value of your property on a superficial level, but if the market sways too far from the original purchase, substantial value will not have been added. Curb appeal, or the external visual appeal of the property as viewed from the street, is a focus area of a cosmetic renovation. While it won’t make a substantial difference in monetary value, a fresh coat of paint and designed landscaping will attract potential buyers and help the property sell faster. When it comes to reselling, styling and interior decoration is another great way to market the property upon completion. The purpose of a value renovation is to make big changes to the property to add considerable value. This is the most standard type of renovation, and generally the most expensive in terms of cost and time. This type of renovation works at any end of the housing market, and the key areas that raise value for money are kitchen, bathroom and curb appeal. The kitchen is seen as the core of the house, so a kitchen remodel goes a long way in improving property value. Safety is key in a kitchen, so it’s important to consider the foot traffic and maintain a layout that accommodates safety standards. Depending on whether or not there is substantial space, adding an island bench to the kitchen increases value by creating more benchtop space and a place to sit. If outdated, fitting new appliances that are energy/water-efficient adds value and provides visual improvement. No matter what your remodelling plan looks like, focus on durability of materials and classic finishes that won’t soon become dated. The ideal bathroom should represent cleanliness and quality. Although one of the more expensive aspects of a renovation, bathroom remodels offer a great return on investment. Ensuring the plumbing is up to scratch and the taps are all in good working order is essential, as this is one of the first things potential buyers will check when inspecting the property. Ditching the plastic toilet seat in favour of a ceramic model will represent quality for buyers and show that the property is newly renovated. If applicable, retiling in shades of white and/or blue inspires notions of good hygiene and calm; buyers are more likely to be persuaded by a white or blue bathroom than any other colour combination. (though with a value renovation it’s assumed that indoor painting would probably be redone as well), and ﬁxing any exterior problems proves to buyers that your property is not only on par with the rest of the properties in the area but exceeds those standard expectations and provides more value. Other considerations for value renovations are reflooring, thermal insulation and glazed windows. Thermal insulation and glazed windows are a great value-add for the property, but they are not physical qualities that prospective buyers can see. Adding hardwood floorboards is the most durable option for flooring and the most attractive when it comes to selling. If the property already has hardwood floors, they can be refreshed and updated by sanding down and applying a new finish. Value renovations involve extensive work, and it’s likely that the selling market will be quite different to the market in which the property was purchased by the time of sale. If the re-evaluated property value is less than the cost of breaking even or making a profit, these properties are worth holding on to rather than selling straight away. If not used as a primary residence, they can be rented or leased, long-term or short-term, depending on the real estate market projections. Preference renovation is quite different to any other type of renovation, as the average standard of other properties in the area isn’t a major factor, and there is less consideration of resale value. Personal preference renovations involve adding unnecessary extras that could be considered luxuries, such as a swimming pool, tennis court or hot tub. Smaller ‘luxuries’, such as a particular stone benchtop or shower heads chosen not for price but for preference, are included in this category. It could also involve elements of all other types of renovations, like structural changes, visual enhancements and value additions, but all in the vein of personal preference. These are the types of properties that are often lived in for a period of time before being resold, as they are made to the buyer’s taste. But it is still just as relevant to be aware of trends and movements in the housing market, because, depending on affordability, there will likely be a timeline of how long the buyer can afford to live in a high-cost house, along with paying the cost of the loan repayments for the renovation. Regardless of the type of renovation you choose to carry out, for your first investment property flip it is advised that you start small. With smaller, less costly properties there is less to lose and less work to be done, keeping both time and cost down. Other considerations throughout the process of an investment renovation are settlement periods, target markets and the option of DIY. Try to negotiate for the longest settlement period (usually 90 days) to allow yourself maximum time to plan and get ready for the renovations to start upon settlement. It’s also important to keep a target market in mind for the property you are renovating, and to design your modifications around that target market. For example, for small properties consider a couple looking to purchase their first home, and the inclusions that would be important to that market. And if you have the time or the manpower, a great way to keep costs down is to purchase materials and do the labour yourself, saving the price of tradesmen and potential inflation of material costs by the builder.